You already know a weekend is turning superb when the Saturday lunch with friends fills your heart more than stomach and that too at a very minimal price, at least I did. A quick plan by a friend on Friday night and I brought up the drive to Kanva, since it was a long pending destination on my list. Every time I had travelled on the Mysore road past Ramanagara, I would see this sign board pointing towards Kanva Reservoir and would make instant distance calculations. Today I finally happened to find the sum! 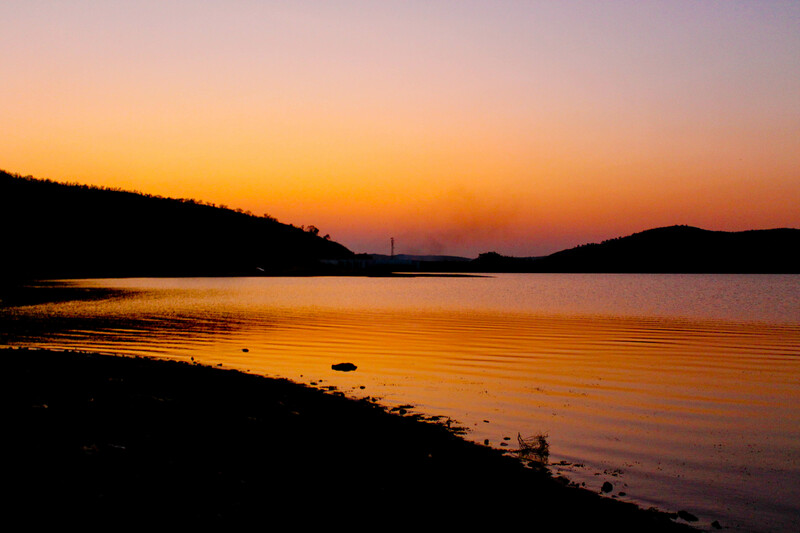 65kms that’s the distance from Bangalore to witness a surreal, extravagant sun set by a water body. Coming to the point, this is my travelogue to Kanva Reservoir, where the river Kanva is contained to form an artificial lake. The hotel was wide empty, not everyone is crazy to have a late lunch like us, well, apart from few house flies that were around! But overall the place was neat and we found they even had CCTV, not one but 5-6 cams. Big shot only, I say! Hell, who cares about how many cams? Food dude, food, screamed my stomach. We ordered for Raagi Mudde and Chicken Guntur and had it served in a short while, told you the place were empty, remember! Forget all that you read until now, if you are to believe me and my taste buds (I just swallowed my drool, again), this was one of the tastiest food that I have ever had. Hot muddes (raagi balls) and reasonably warm, spicy chicken Guntur gravy! Yummy till the y!! Three point five stars if I got to say it the Bangalorean rating way! It was like a treat after enquiring few hotels and having driven hungry for close to 50kms. We hogged on the tasty palate along with a Maaza (No, this is not an endorsement!) and after three of us had lunch to heart’s content, the bill was less than 200 rupees! Tasty deal this! Hotel details? The MBC Nandini, Ramanagara. As you approach Ramanagara junction, at the left curve look for a Punjab National bank on the right and exactly opposite to that is MBC Nandini. Or if you are looking to the left then you should easily spot this hotel, unless you are blind of hunger! Go for it! Stomachs filled, pocket still good, we continued our drive ahead! Few kilometers from the hotel and you would spot a temple and a right deviation, well that’s if you are watching the right! If you are a revolutionary, Left wing activist then find the Karnataka Tourism board (sorry, not in crimson red) planted on the left! 😛 Kanva Reservoir,11kms, the board reads. Take a right deviation here and the countryside welcomes you instantly. Green locales, Raagi and rice husks on a road that seems to be straighter than a scale. I’m serious; the road stretches straight until you can reach your eyes. Ladies cleaning the raagi by the road, men finishing up their evening choirs at the farm, this village setting was straight out of the books kind. 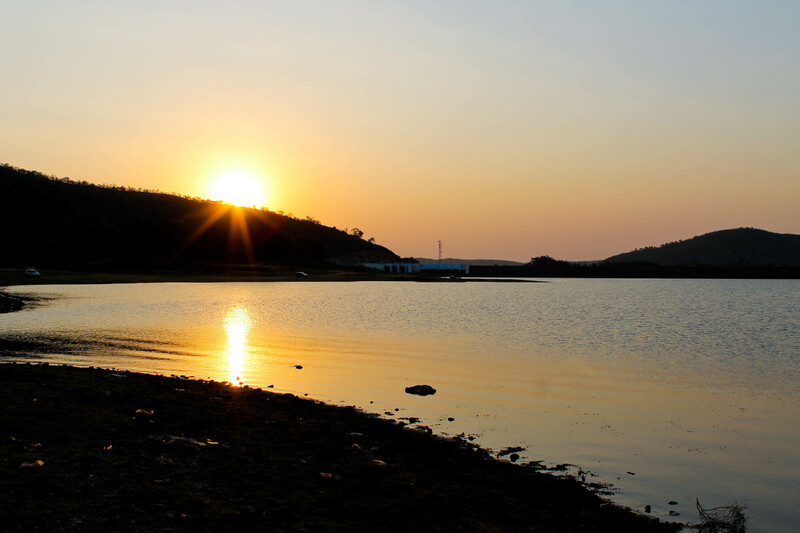 Drive down another couple of kilometers and it makes way into the Kanva reservoir. Kanva is a sage who is believed to have lived on the hills hovering around this river during Ramayana, after whom this river was named. 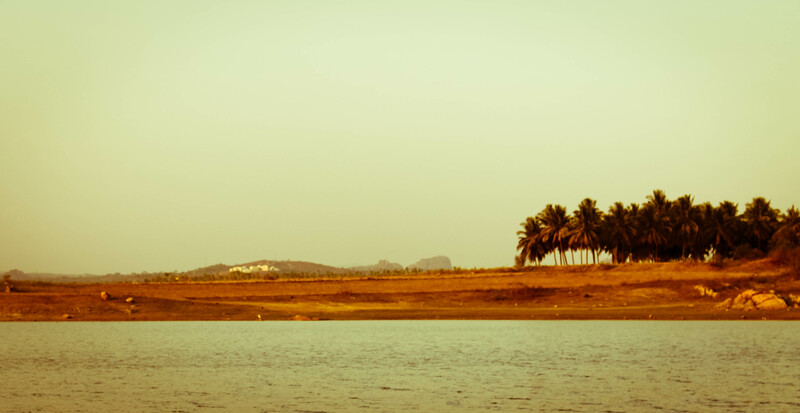 In 1946, a dam was constructed across the Kanva River for small irrigation purposes. Also a fishery research centre has been set up near this catchment area. You can take your vehicle until the waters. Park it somewhere out there and take a lazy stroll across the banks. There is a coconut grove beyond the waters which makes the setting look like a beach! If you are a birding enthusiast then this is the place you would want to be in. Lot of species seeming to be on a picnic, taking walks around the waters on a weekend! We sat back on a rock stretching into the waters. Feeling the wind in our hairs and staring at the swaying ripples on water it just feels like heaven! Let the world pass by; Feel carried away; Unwind hearing the waters romance the wind. The atmosphere inspiring and the breeze calm, fresh and lively. As we were enjoying the tranquility, time passed by and the sun started to go down. Like a complacent warrior returning home after winning the war, the bright red star started to sulk into the peacefulness after lighting the world once again. The setting was perfect looking for a busy day end. Composed, lull and sedate, the illuminant star painted the horizon in hues & pigments of orange. Between two hills that looked like overlapping from the place we sat, the orange glob went down, uplifting the entire backdrop. Now it was the lake’s turn! As if it had just swallowed the orange sun, the water showed up change in tint, enlivening. The ripples that swayed got starker now, complimented with a wine red hue and flaunting the sensational blush! Surreal – just as dreamy as it can get! 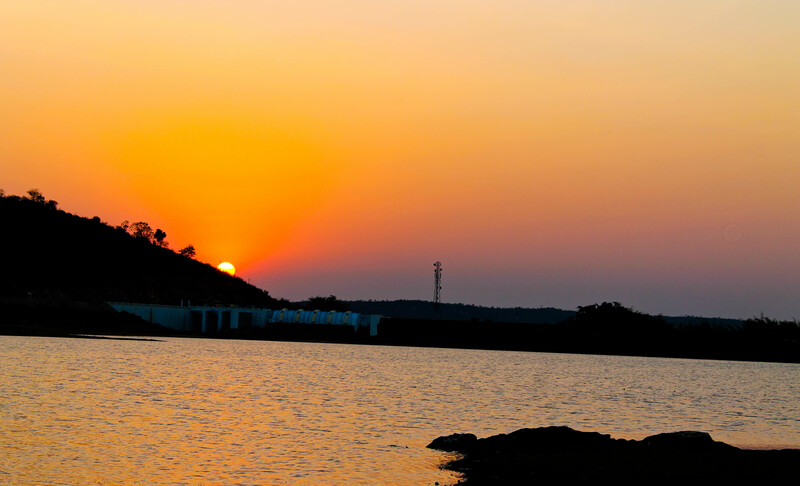 Head to Kanva dam for a sun set that will charm you every second! Love love the photos! What camera did you use? Thanks, Lorraine! 🙂 I use a Canon 1100D!